June 25 is National Catfish Day in the USA. The holiday was designated by President Ronald Reagan on June 25 in 1987. National Catfish Day celebrates the value of farm-raised fish. In 1986 catfish comprised the third highest volume of fish consumed in the USA and 99 % of which are farm-raised. The most commonly eaten species of catfish in the USA are channel fish and blue catfish. These species are raised in clean freshwater ponds on farms across America and fed with soybean meal, fish meal, corn, vitamins and minerals. 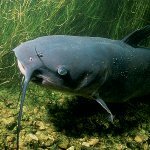 Channel fish is the most numerous catfish species and it is an official fish in Iowa, Missouri, Nebraska, Kansas and Tennessee. Approximately 8 million anglers target channel fish annually and this species is regarded one of the most valuable. National Catfish Day will be nothing without noodling. This is a fishing kind for catfish only, that is allowed and practiced in 11 states of the USA. Noodling requires placing bare hand inside a discovered catfish hole. Although one may think, that noodling is easy kind of fishing, it is very dangerous for a fisherman.